Industrial Strength Fasteners are excellent for indoor and outdoor use where extra holding power is needed. Industrial Strength VELCRO® Brand fasteners stick to most surfaces, including plastic. These fasteners are water resistant and perform well over a broad temperature range. The plastic molded hook and extra wide 2" closure offer strong, water-resistant holding power. 25 yard rolls (hook and loop sides sold separately). VELCRO® Brand HTH 805 P/S 0119 INDUSTRIAL STRENGTH HOOK in 12" width: this product is available in three options: 12" x100 yard roll $699 per roll, 12" x 1 yard increments $9.98 per yard, or custom die cut to your specifications. 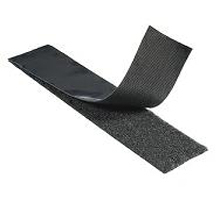 This product is commonly used for replacements on concrete sanding pads. VELCRO® Brand MVA#8 Adhesive backed 1" wide x 25 Yard Roll.